A novel platform for delivering cancer treatment drugs was the grand prizewinner of the 16th Annual McCloskey Business Plan Competition, an annual competition sponsored by the University of Notre Dame’s Gigot Center for Entrepreneurship. Certus Therapeutics took home the top prize of $25,000 after competing against seven other ventures during a live event on April 15 at the Mendoza College of Business. Certus makes a liposome product called Lypos, a nanoparticle drug delivery platform with the potential to target cancer cells, lessen the toxic effect of cancer medications and increase a patient’s quality of life. 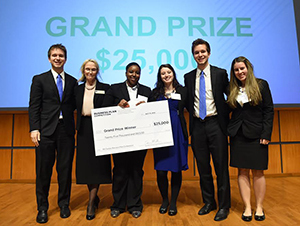 The winning team was made up of five graduate students representing four academic programs, including business, law, science and entrepreneurship: Rebecca Shute, ESTEEM ’16; Brittany Butler, MS Law ’16; Kevin Schneider, MSA ’16; Michael Schneider, MSA ’16; and Charissa Quinlan, Ph.D. Integrated Biomedical Sciences ’18. The McCloskey Business Plan Competition, sponsored by the Gigot Center for Entrepreneurship at the Mendoza College of Business, is intended for traditional entrepreneurial ventures that have not yet been launched or are at the earliest stage of launch. This is typically defined as ventures that have earned less than $500,000 in cumulative revenue, received less than $500,000 in external financing and have been in operation for less than three years. All Notre Dame students, alumni, faculty and staff may compete in McCloskey, which annually awards more than $300,000 in cash and in-kind prizes; however, each team must include a current Notre Dame student who is integrally involved in the business planning process. The nanoparticle technology underlying Certus’ Lypos platform was developed by Basar Bilgicer, associate professor in the Department of Chemical and Biomolecular Engineering. Gaylene Anderson, senior innovation officer for the Cleveland Clinic and Tech Transfer at Notre Dame, advised the Certus team. Other top prizewinners included Safetap, a suicide prevention mobile application that includes school-specific resources for high school and college students, a therapist search and crisis resources, which won the Klau Family Prize for Greatest Social Impact and the Sutherland Family Award for Best Presentation, a prize decided by audience vote. POLCO, a civic engagement and policy participation platform that allows citizens to participate in their city’s town hall meetings in a simple online and validated way, won the $5,000 McCloskey Runner-Up Prize. The Vennli Award for Best Undergraduate Venture, a new prize first offered in 2015 to a team made up entirely of undergraduate students, went to Banco de Alimentos Panama, the first-ever food bank created in Panama by raising about $300,000 of seed capital. The complete list of prizes and winners can be found here. A total of 124 teams entered the McCloskey Competition last fall, with 20 teams advancing to the semifinal round on April 14. Eight ventures presented their plans during the live final competition on April 15. Nearly 200 judges and mentors, including members of the Irish Entrepreneurs Network and the IrishAngels Investing Group, have worked with the teams to valuable feedback and mentoring. The Gigot Center for Entrepreneurship was established in 1998 for the purpose of fostering innovation among current and aspiring entrepreneurs. Through a unique curriculum, business plan competitions and mentoring opportunities with Notre Dame alumni, students gain vital experience and the skills necessary to build successful businesses or to apply entrepreneurship skills within an existing organization. For more information about the McCloskey Business Plan Competition, visit gigot.nd.edu/mccloskey-business-plan/. Originally published by Carol Elliott at news.nd.edu on April 22, 2016.